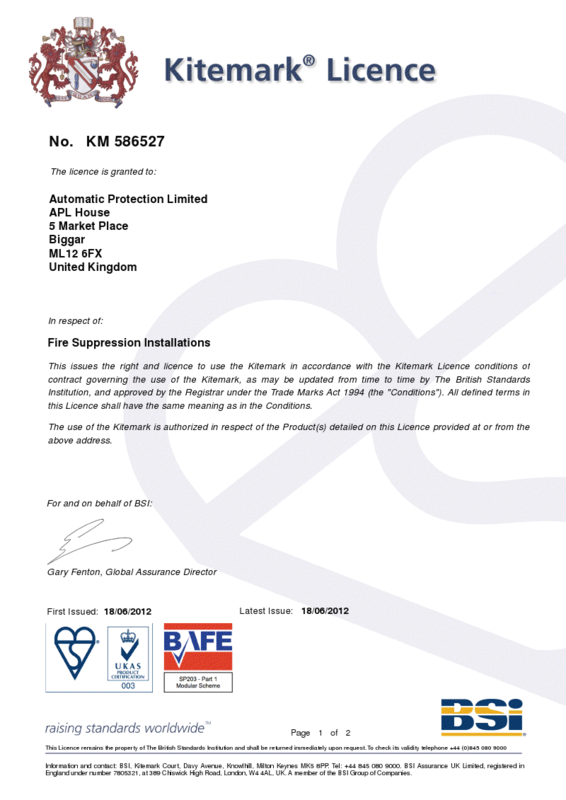 Automatic Protection Ltd of Biggar, Lanarkshire, Scotland has been awarded a prestigious Kitemark licence for BAFE SP203 part 1. Kitemark schemes are voluntary, this shows that we are committed to providing our customers with the very best quality and service. Furthermore, as a Kitemark licensee we are regularly inspected to ensure we continue to deliver the same quality and safety every time. Automatic Protection Limited (APL) was established in January 2001 by Father and Son team Neil and Stuart Harrison. Based in the border town of Biggar, South Lanarkshire, APL has over 45 years of experience in the fire and security industry with unparalleled expertise in Automatic Fire Extinguishing & Suppression systems. APL offers a complete package of: Design, Installation, Commission & Maintenance of each system, this includes automatic detection: smoke, flame, heat and HSSD (high sensitivity smoke detection) and the suppression system with whichever extinguishing agent is required. APL can also offer assistance in the sealing of the protected rooms and include full Room Integrity Testing. BSI and the Kitemark are well established in the industry for testing and certification of a wide range of products and services. With over 100 years of experience and market exposure the Kitemark can help manufacturers or service providers to gain and retain market access, manage risk and increase revenue and profitability. Stuart Harrison, Director says “We pride ourselves in providing our customers with the very best quality products and service so that our customers are assured of a level of service unmatched by many others in the industry. In this competitive market, we must keep ahead and Kitemark certification – because of its independence, integrity and trust – gives our products and company a real competitive advantage.” APL are specialists in the niche market of design, installation, commissioning and maintenance including, room integrity testing, of gaseous suppression systems. 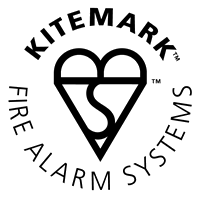 The Kitemark is one of the most respected product quality marks in the world, demonstrating that a wide range of products from lighting to fire extinguishers conform to standards, ensuring that vital safety and performance requirements are met. The word Kitemark and the Kitemark logo are registered trade marks of BSI. A combination of a quality based system, such as BS EN ISO 9000, with advanced product/service testing provide the basis for a Kitemark scheme offering trust, integrity and quality. Testing and certification of services and products for Kitemark and CE marking to UK, European and International standards. BSI is a Notified Body for 17 New Approach EU Directives.